The LD25 is not (much) more expensive than an Astrolux DD driver, is it? You can resistor mod it to 4 Amperes if you want (maybe more?). The current adjust point is a pinhole with annular ring where you can insert and momentarily solder a small wire to tap on negative/ground for adjusting. Be aware of the voltage drop in the power supply to driver path (wires and connections) when raising current to high levels, 0.2Ω in the path at 5A is a full volt. Increase supply voltage accordingly to see and tune higher values. Location: Near to my soldering iron. But the LD25 only capable 3A max and this led need 5A to reach it full potential. Why? Did you tried to ramp its current up and did not succeeded? No I don’t have LD25. Just from fasttech data I thought it has a max limit at 3A. Ok. I went into my cold shed for you guys and have some measurements. I think I usually measure a bit lower than others around here and I measured some lights again to have a good(ish) reference. I have a almost clear image of the die, but I feel it can be a tiny bit better focused. I did not measure ampdraw, but I got best results using an old protected keeppower 18650. With better cells I got worse results. So it is indeed better to keep the amps down a bit. Oh la laa.It is time to take out of the drawer my Cometa,which gives 164Kcd with the Z1 original lens…. Is there some special difficulty with the Cometa’s mod? Lack of regulation means the user needs to carefully consider and adjust lots of parameters to avoid overdriving emitters or just running them past their optimal points. This can mean tuning resistances for the whole chain of parts inside a flashlight. 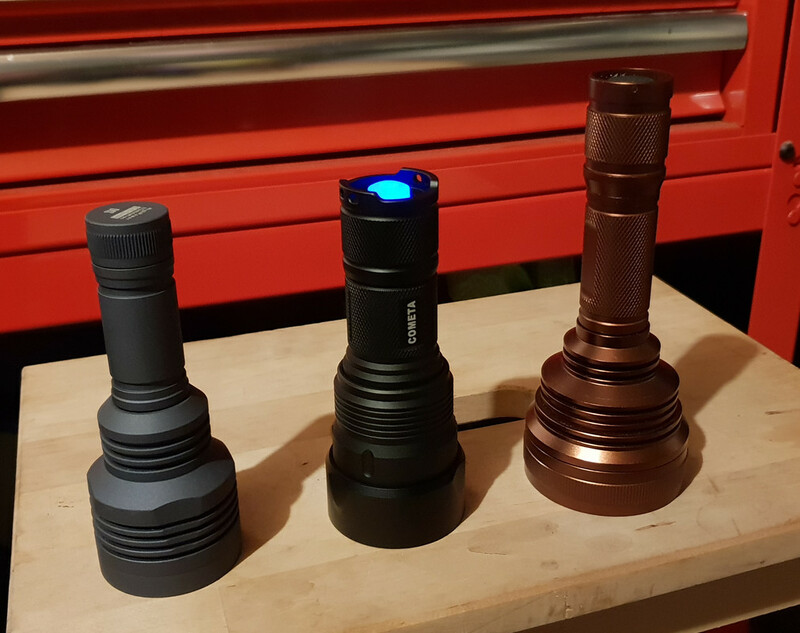 All that careful consideration and adjusting described above I do for every driver not just DD ones, every flashlight build I try to give its own optimal configuration. The LD25 can be a nice option too but has its own characterics, positives and negatives. It does not come in many sizes for example (i.e. I just reflowed a 15mm FET+1 driver with A6 firmware, working perfectly in a small EDC). Does it really go up to 5A? Don’t get me wrong, I prefer current regulation for a lot of flashlight builds, but in many other situations DD is the way to go for me. For the others, the “White Flat” is perfect ! Now the most impressive IMHO are the Cometa which turns into a white laser with this LED and the R20 which really throws a strong beam with its tiny reflector… Oh and the beam is really clean, without artifacts. Good work! The Cometa looks awesome id be interested in the throw numbers if you bother taking any. Where did every one buy the LEDs from? Any international friendly sources? When you say “white flat”, you mean this new OSRAM KW CSLNM1.TG led? Looks like a good LED, but it seems like it doesn’t beat the dedomed XPG2 by much in terms of throw in the examples above. E.g. the D80 and S8. I recently measured a dedomed XPG2 (new style) in an S2+ smooth reflector at 29kcd. Is this an issue of improper focus or reflector imperfections or over/under driving? What are people’s understanding of this? Same happens with Mikos super reflector 15$ thrower (Supwildfire something) that should easily brake 400 kcd mark. But with OW i think it is nice thing to stay in regulation. 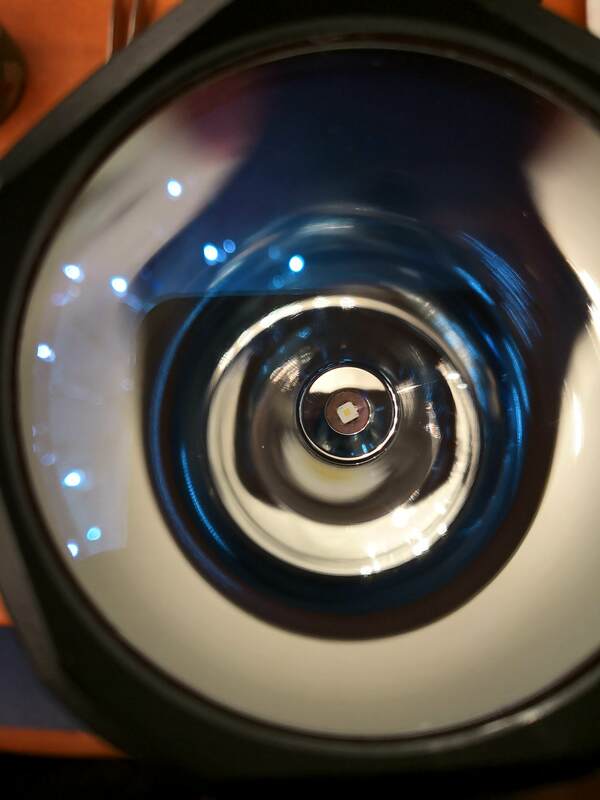 Has anyone considered to put this one into the BLF GT or Astrolux MF04/Mateminco MT35+? It would be quite some laser beam. I think that’s the old version of the LD25. Played with the focus on my cometa today (removed the oring between the lens and the bezel, and turned the light not fully out) getting 360kcd out of it now. Also hold the lens of my b158 in my hand in front of the cometa withiuy bezel trying to focus it and saw 390kcd. So with a good brinyte you should be able to go 400+. 560KCd in short Maxtoch SN6X-2X with 4A LD-2 driver. Ordered some White Flat’s on saturday, and they arrived tuesday. As always in good order (kudos Neven). Took a C8 host, an X6/X5 driver, an XR reflector (Fasttech), a Canadian cent, and a 3535 centering gasket. The cent I needed because the reflector is circa 1mm shorter than the original one and the gasket got a djozz-micro-mod to fit the 3030 emitter. Difference is I made it black with a felt tip pen. Let’s start by saying that I followed the budget luxmeter comparison of djozz with great interest. So my mindset was to take the results of my 1010B luxmeter only serious when used as relative values. Nevertheless, the meter started out at 171kCd and slowly decreased to 130-ish kCd for the C8 + Osram. Then I put my Olight MX2UT on the line, and it scored a pretty constant 119kCd on my luxmeter. 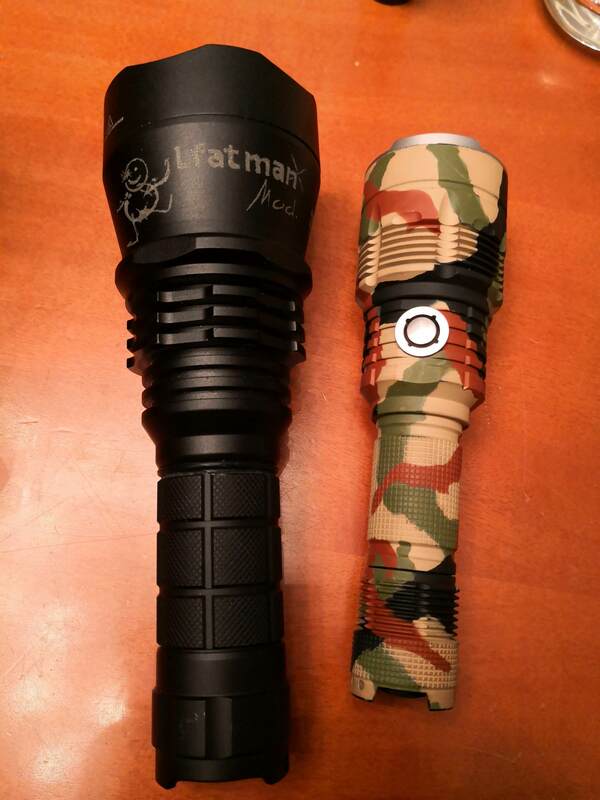 Below is a side by side comparison of the C8 (left) and the MX2UT with dedomed XM-L (right) on full blast. Edit: the abnormal looking hotspots are caused by the paper I shine on. It is a bit wrinkled. I’m not familiar with that reflector. Is there an advantage over the stock C8 reflector? Barkuti, thanks for pointing out LD25 driver. I think it is the most suitable and cheap too. It is proven this LED will turn blue with DD driver using good cell. I am wondering if we set the Cometa stock driver to its muggle mode that has half of Turbo as highest mode, will it be okay and not to driver it blue? I am not familiar with its stock driver. wondering if it will survive with DD vtc6/30q on my couroui D01 with copper pill and 32mm copper pcb. Even if it survive, its output is lowered. So why take the risk. 560KCd in short Maxtoch SN6X-2X with 44 LD-2 driver. 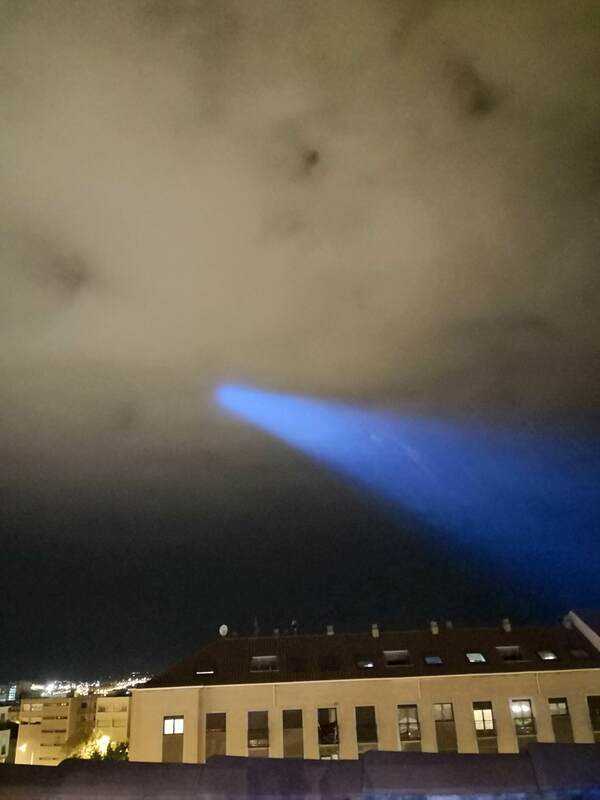 Could we put this led in a Maxtoch 2X shooter? In theory, the X5/X6 muggle mode should not help because the led is still driven at the same very high current that the led can’t handle, with the PWM only switching it on/off fast. In practice, part of the why leds perform lower at too high current is heat, and that is reduced when the led is PWMed, so you will see an improvement (i.e. PWM-ing an angry blue overdriven led will in general improve the tint). But much much better is reducing output by actually lowering the current. Thanks for explaining. I was hoping the PWM voltage going up and down fast that LED current can’t keep up and average out at lower level instead of pulsing let’s say 6A on the LED. 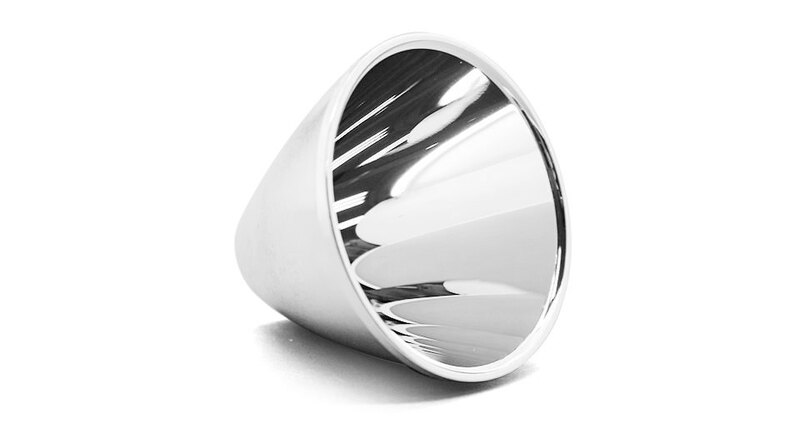 The XR reflector is optimised to handle emitters with a smaller footprint and a smaller die. Usually, emitters in de C8 have a 5050 footprint, like the good old XM-L(2). To address the question, first a distinction needs to be made between phosphor LEDs (#1) (e.g. white LEDs, possibly some green LEDs) and direct emission LEDs (e.g. most visible color LEDs, IR and UV LEDs). 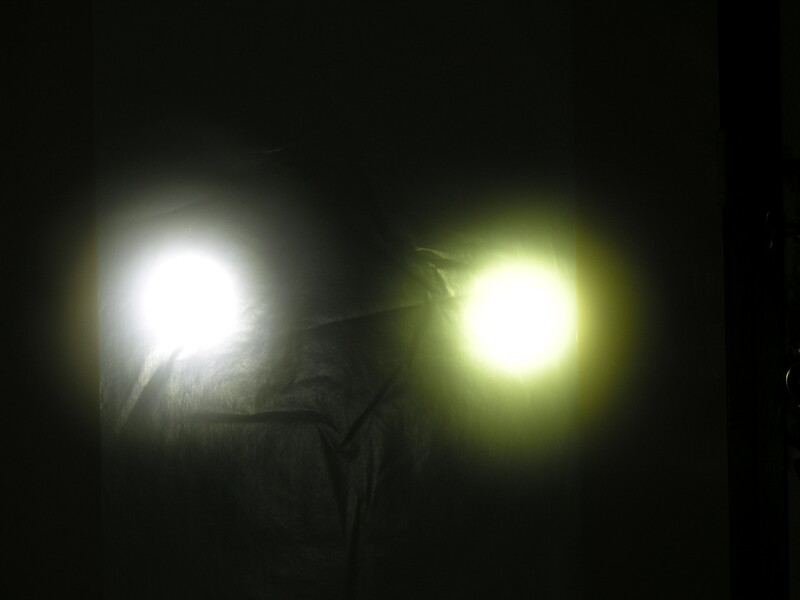 Direct emission LEDs typically have a turn-on time in single-digit nanoseconds, longer for bigger LEDs. Turn-off times for these are in the tens of nanoseconds, a bit slower than turn-on. IR LEDs typically show the fastest transition times, for reasons given ahead. Special purpose LEDs are available, whose junction and bond-wire geometries are designed specifically to permit 800 picosecond to 2 nanosecond pulses. For even shorter pulses, special purpose laser diodes, in many ways operationally similar to LEDs, work all the way down to 50 picosecond pulses. As pointed out by @ConnorWolf in comments, there also exist a family of LED products with specialized optical beam shaping, that boast pulse widths of 500 to 1000 picoseconds. Phosphor type LEDs have turn-on and turn-off times in the tens to hundreds of nanoseconds, appreciably slower than direct emission LEDs. Inductance of the traces causes longer rise and fall times. Longer traces = slower transitions. Junction capacitance of the LED itself is a factor(#2). For instance, these 5mm through-hole LEDs have a junction capacitance of 50 pF nominal. Smaller junctions e.g. 0602 SMD LEDs have correspondingly lower junction capacitance, and are in any case more likely to be used for screen backlights. Parasitic capacitance (traces and support circuitry) plays an important role in increasing the RC time constant and thus slowing transitions. Typical LED driving topologies e.g. low-side MOSFET switching, do not actively pull the voltage across the LED down when turning off, hence turn-off times are typically slower than turn-on. As a result of the inductive and capacitive factors above, the higher the forward voltage of the LED, the longer the rise and fall times, due to the power source having to drive current harder to overcome these factors. Thus IR LEDs, with typically the lowest forward voltages, transition fastest. Thus, in practice the limiting time constants for an implemented design can be in the hundreds of nanoseconds. This is largely due to external factors i.e. the driving circuit. Contrast this with the LED junction’s much shorter transition times. To get an indication of the dominance of the driving circuit design as opposed to the LEDs themselves, see this recent US government RFI (April 2013), seeking circuit designs that can guarantee LED switching time in the 20 nanosecond range. LED get switched on really fast. Tough to make it works without risk destroying the LED. Has anyone got an idea how to pimp this driver to 4 amps? Maybe this one could be another alternative to the LD25, LD29 (Convoy L2 driver), Neven's LD4A and the Convoy Biscotti driver with stacked AMCs?